Not so long ago we told you about how to create your own GTA Online missions and races, as well as two portions of approved game’s jobs, and today we’d like to share new information about the multiplayer of the popular Grand Theft Auto 5. Thus, yesterday, the developers of this awesome game series presented new GTA Online jobs, created by players, and later selected and approved by Rockstar’s employees. So if you are a true fan of the franchise, we advise you to read them, and maybe to play. At first glance it seems that this is a simple circuit in the form of eight, but actually it's a pretty difficult track. Olympic Freeway is a highway, the length of which is only 0.8 miles (or 1.28km), the number of participants is 8, and its greatest difficulty is steep descents and climbs. Here we are not talking about a simple route in the Palomino Highlands, but the incredibly dangerous derby where many barriers and obstacles are placed and where each meter may be a decisive one. This mission allows up to 16 players to participate in the derby and show who has the skills of the better drifting. This track consists of three laps of the circuit near the Observatory, the main risk of which are lots of barriers that don’t give you any chance to overrun your opponent. The only opportunity to win is to outpace the enemy on the corners. This mission takes place on a very narrow and dirty roads near Cassidy Creek. Your main task is to make as less mistakes as you can, not to fall into the river and bring the race on a motorcycle to the finish. This race takes place around a pretty large vineyard and consists of several tricky turns, sandy stretches and oncoming traffic. Be careful! 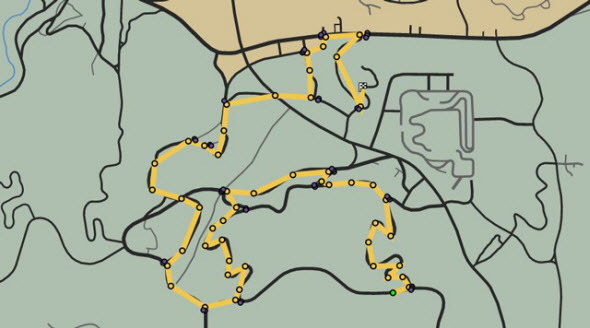 The next race, which has been added to the new GTA Online jobs, takes place in the coastal town, entitled Sandy Shores. Here you will see the tricky 45 degree turns, the sand drifts, as well as the all-round accidents and the jump straight into the Alamo Sea. This mission takes place in the Senora Desert in Blaine County and promises you lots of steep descents and climbs, as well as a lot of places for drifting on the dirty and unpredictable roads in the valleys and mountains. The most important thing here is to select the correct car and control it. This race, as you have probably already guessed, is a tribute to the famous track in Nurburgring (Germany). It is technically difficult and dangerous circuit with the blind corners, bumps and long road. As you can guess from the title, it's a battle of two teams in the distant swamps, where the key to success is the balance of weapons, skills and technologies. If you will keep this balance, the victory is yours. And finally, the last one of the approved GTA Online jobs takes place on the Del Perro beach, which was cleverly transformed into a speedball arena. Here you need to correctly place props and be as tricky as you can. And what do you think about new GTA Online missions? Did you like some? Your answers can be left at the bottom of the page.